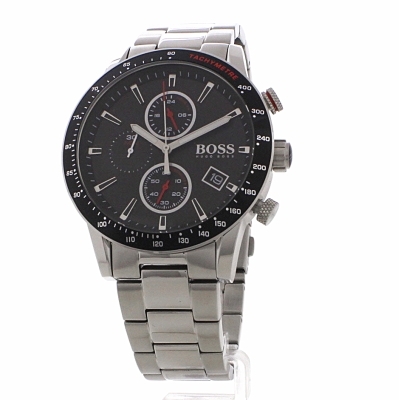 Hugo Boss Rafale 1513509 is a functional and attractive Gents watch. Material of the case is Stainless Steel and the Black dial gives the watch that unique look. The features of the watch include (among others) a chronograph and date function. In regards to the water resistance, the watch has got a resistancy up to 50 metres. It means it can be submerged in water for periods, so can be used for swimming and fishing. It is not reccomended for high impact water sports. We ship it with an original box and a guarantee from the manufacturer. Really glad I chose this watch for my boyfriend, it was affordable compared to other popular watch makes but the quality nor appearance came at a compromise for this! It looks and feels high quality and sophisticated! I struggled to pick between the two colours this watch comes in, really pleased with the black though! The straps came with plenty of links to ensure a big enough fit for any wrist, we had to remove two links which was quick and easy to do! Nothing bad to say about this watch, stylish, comfortable and it displayed a number of useful features. All in all a very good product. Im very pleased with the look and feel of the watch. Its easy to read and use. Although the operating instructions were missing it was straight forward to adjust the time and small dials. The strap adjustment is through the removal of links, so it could be tight or slightly loose, depending on how many links are removed. The strap could do with two smaller, half size, links to give it more adjustment. Otherwise a great watch. This Hugo boss watch is simply amazing. The coulor combination is very good with the silver and black going together very well. The watch is perfectly weighted and is neither too heavy or too light which makes it very comfortable on the wrist. Also comes in a good size to fit the wrist but if it doesn’t fit it is very easy to get it fitted to your size. 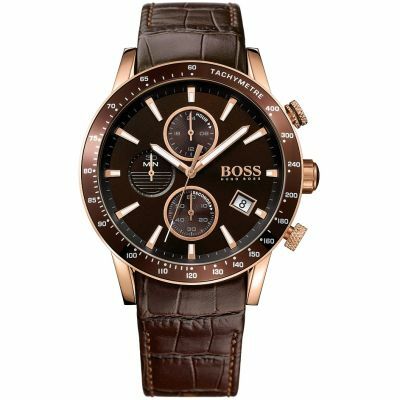 This Hugo boss watch is very good and anyone looking to buy a watch I would suggest them to buy this watch. Bought this for my grandsons 18th birthday. The watch is extremely good quality, stylish with a clear face and easy to set time and date.